Trio 3-in-1 Wood High Chair - Ellison is rated 4.6 out of 5 by 25. All the functionality and intelligent design of Ingenuity’s best selling high chair is now available in a beautiful real wood finish. As every parent knows, kids grow up fast. The Trio 3-in-1 Wood High Chair easily adjusts from full-size high chair to booster seat to toddler chair. The chair wipes clean instantly and features a dishwasher-safe tray and washing machine-safe seat pad, so you can slow down the clock by spending less time on kitchen cleanup and more time with your family. The EasyClean tray also features four locking positions to grow with your baby. And as your family expands, it can too. When used as a booster and toddler chair, it can seat two children at the same time. Rated 5 out of 5 by Dtamplin from Favorite! This. Highchair. Is. Amazing! It is so versatile. The three ways to use it make it easy for any seating scenario. The wood is of great quality and both the wood and plastic pieces are all very easy to clean. The color scheme is super cute and gender neutral. I would highly recommend this product! Rated 4 out of 5 by MamaCoe from So much versatility! Such an easy setup! Took less then 15 minutes to set up when I unpacked the high chair from box. All of the tools came with the 3-in-1 Ellison Chair to complete. We currently are on week two of testing out our new chair. The chair is very sturdy and my little guy looks very comfortable. Super easy to clean! The tray fits right into the dishwasher and the pad can go right into the clothes washer for the crazy bad messes. The chair resembles a nice furniture piece, it isn't an eyesore like some other baby gear. Only gripe would be the wheels on the chair do not move easily, but our chair stays in one place so no biggie for us. We are very happy with our new high chair! Rated 5 out of 5 by Tracey1361 from Grow With Me High Chair I absolutely love this high chair. Both of my little ones are boys but this would be perfect for either boys or girls. I really like how practical it is. It really does grow with your child. My almost 7 month old can sit in it (with the straps) and also, my 3 year old. I wish I had two of them as the toddler chair works GREAT with my 3 year old. This has come in handy for both of my children. Features that I really like..... my favorite is probably the removable tray insert. I can take the insert off and clean up before taking my baby out of the seat. What a great new invention! Also, I like that it reclines to different levels. OH, and the material in the seat is machine washable. How great is that!! They've come a long way from the ugly non practical high chairs when we were growing up. I can't say enough great things about this high chair. It's really come in handy and my boys seem to really like it. I've also had other mom compliment the high chair and ask more about it. You won't be disappointed!! 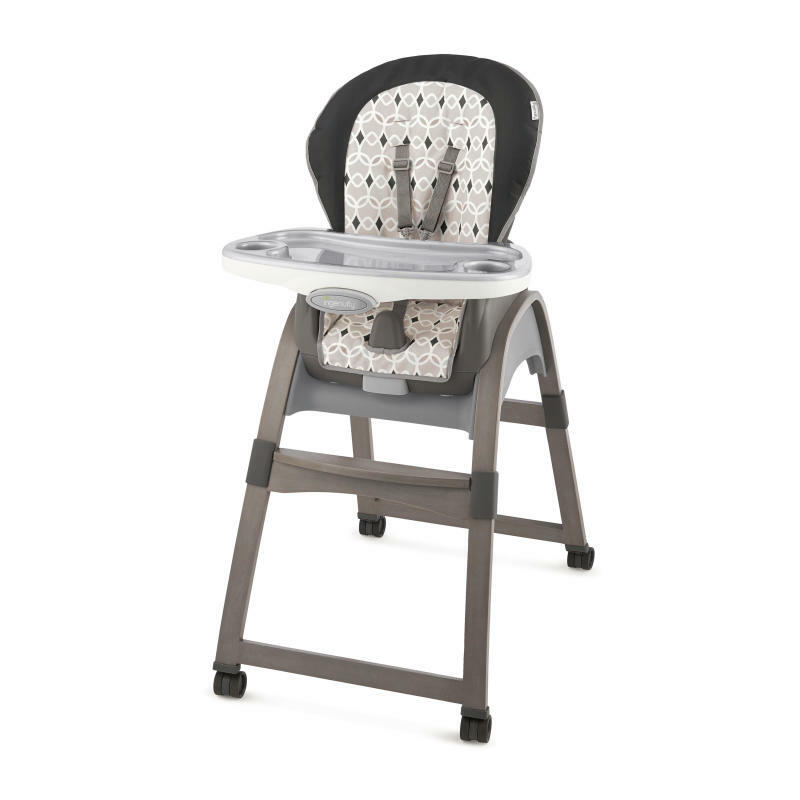 Rated 5 out of 5 by Crystalb2286 from Love this high chair so many functions! This high chair is by far my favorite I’ve ever found or seen, I was a bit nervous about putting it together but it literally took less than 20 min from start to finish! I love that the top of the tray comes off and fits in the dishwasher, and the seat cover is washable because with little ones these get dirty quick. I also loved that not only does it function as a full size high chair we can take it along with us as a space saver high chair which will be a great use when visiting family for the holidays! It is also nice that not only once you move out of the high chair phase it converts to a booster seat and then a toddler chair! Highly recommended this is a must buy item! Rated 5 out of 5 by Crystalb2286 from Love this high chair so many functions! This high chair is by far my favorite I've ever found or seen, I was a bit nervous about putting it together but it literally took less than 20 min from start to finish! I love that the top of the tray comes off and fits in the dishwasher, and the seat cover is washable because with little ones these get dirty quick. I also loved that not only does it function as a full size high chair we can take it along with us as a space saver high chair which will be a great use when visiting family for the holidays! It is also nice that not only once you move out of the high chair phase it converts to a booster seat and then a toddler chair! Highly recommended this is a must buy item!